Wine Market Council is a non-profit association of grape growers, wine producers, importers, wholesalers, retailers, and other affiliated wine businesses and organizations. “At our Yountville conference in March we made a correction to the data that was originally presented at our New York presentation in January,” said John Gillespie, President of Wine Market Council. 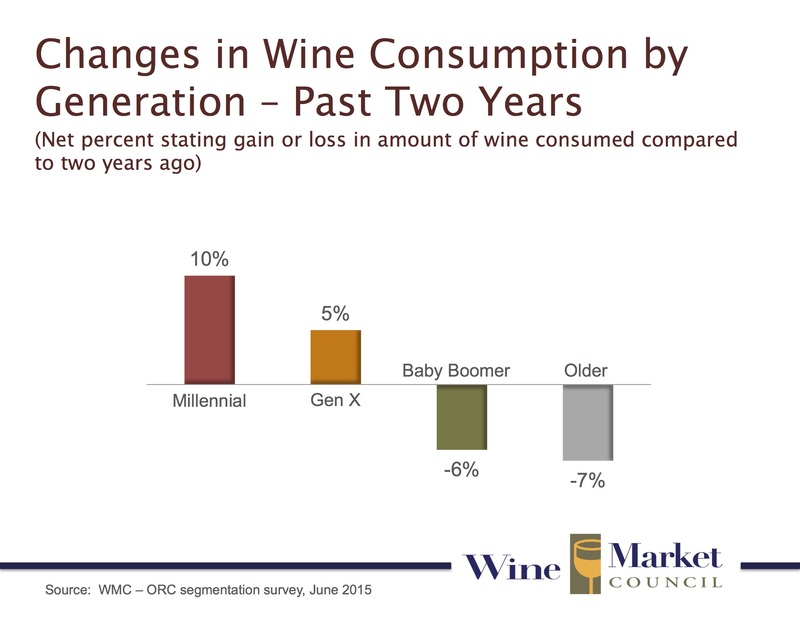 Wine Market Council, a non-profit association of grape growers, wine producers, importers, wholesalers, retailers, and other affiliated wine businesses and organizations, today announced a clarification on Millennial wine drinkers and the consumption habits of other generations that were presented at the 2016 Wine Market Council Research Conferences. The error was caused by using data from the WMC annual Consumer Tracking Study of “High Frequency” wine drinkers in place of a similar data point from the WMC annual “Consumer Segmentation” study. That error was corrected at the Yountville conference in March. “The overstatement of glasses per occasion, once corrected, leaves us with the conclusion that while Baby Boomers remain the largest wine consuming generation, Millennials are rapidly closing that gap,” Gillespie added. Wine Market Council has been reporting on consumer wine consumption habits for the past twenty-two years through their annual consumer surveys. The Council retained ORC International, a leader in business intelligence, to conduct the consumer segmentation study of 2,936 U.S. wine drinkers in June, 2015. Gillespie adds that while incorrect data points were used to make the original calculations, the final conclusions remain the same. FACT: There are more Millennial adults in the U.S. than Baby Boomers (79 million Millennials vs. 75 million Baby Boomers). Source: American Demographics classification of U.S. Census Bureau data. FACT: There are more Millennial wine drinkers in the U.S. than Baby Boomers, (36% vs. 34%). As of January 1, 2016, every Millennial is now of legal drinking age. Source: Opinion Research Corporation survey of census-adjusted U.S. adults (n = 2,936) June, 2015. 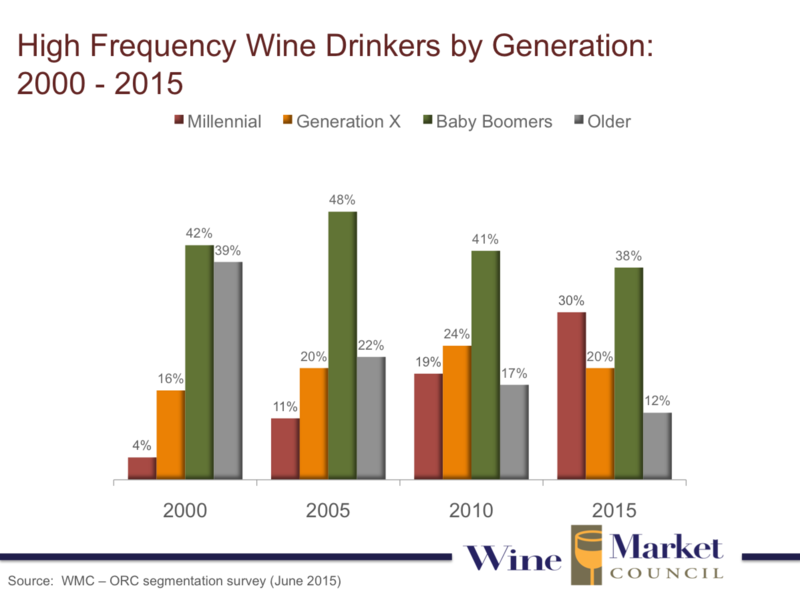 FACT: While there are slightly more Millennial wine drinkers than Baby Boomers, more Baby Boomers than Millennials are “High Frequency” wine drinkers (38% vs. 30%). Thus, Baby Boomers still account for a greater total volume of wine consumption than Millennials, though the gap between these two groups is not great and is closing each year. Source: Opinion Research Corporation survey of census-adjusted U.S. adults (n = 2,936) June, 2015. 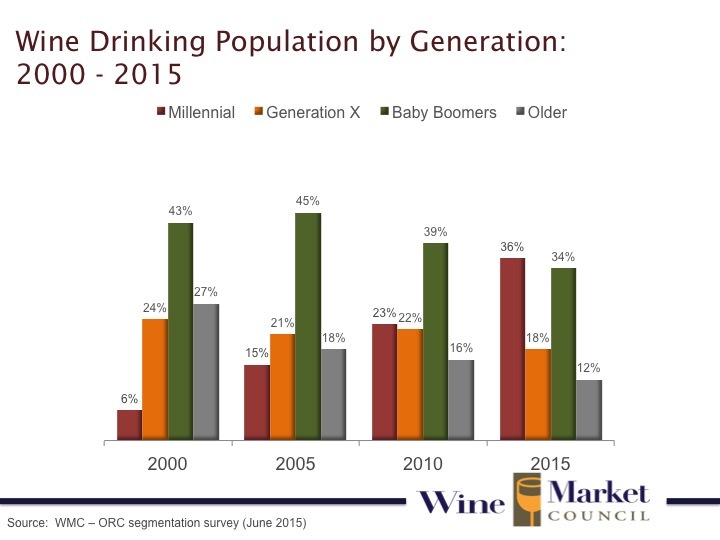 FACT: Over the past 15 years, the Millennial share of the U.S. wine drinking total population and High Frequency wine drinking population have grown significantly, as the two charts below demonstrate. Source: Wine Market Council consumer segmentation surveys of 2000, 2005, 2010, and 2015 conducted by Merrill Research and Opinion Research Corporation. FACT: Younger generations continue to modestly increase their wine consumption compared to one or two years past, while older generations display modest decreases in consumption compared to one or two years past, as indicated in the chart below. Source: Opinion Research Corporation survey of census-adjusted U.S. adults (n = 2,936) June, 2015. Wine Market Council’s 2016 Consumer Research Conferences took place on Monday, January 25 in New York and on Thursday, March 10, 2016, in Yountville, California. Wine Market Council is a non-profit association of grape growers, wine producers, importers, wholesalers, retailers, and other affiliated wine businesses and organizations. The council’s mission is to grow, strengthen, and stabilize the wine market in the U.S. on behalf of all segments of the industry. Wine Market Council provides its members with consumer research that is proprietary to Wine Market Council members, who incorporate it into their strategic planning, marketing and sales execution. Wine Market Council was established in 1994 as a non-profit (501c6) trade association working through all tiers of the U.S. wine industry to grow the wine market. More information can be found at WineMarketCouncil.com and on Twitter @WineMktCouncil. There are more Baby Boomers than Millennials are “High Frequency” wine drinkers. Source: Opinion Research Corporation survey of census-adjusted U.S. adults (n = 2,936) June, 2015. Younger generations continue to modestly increase their wine consumption compared to 1 or 2 years past. Source: Opinion Research Corporation survey of census-adjusted U.S. adults (n = 2,936)June, 2015 There are more Millennial wine drinkers in the U.S. than Baby Boomers. Source: Opinion Research Corporation survey of census-adjusted U.S. adults (n = 2,936) June, 2015.